I know they can’t help it, and we should all be happy we can’t remember getting our own teeth, but OMFG teething is horrible….for parents! Gigi was so good and hardly made a fuss, Blake on the other hand (typical man?!?) is very fussy!! So I thought this weeks blog post could be about what I’ve found that helps me… I mean him!! I do like to keep things as natural as possible, don’t get me wrong by the time Gigi was 2, ‘Calpol’ and ‘Neurofen’ were very much part of her vocabulary, but nevertheless I think it’s worth giving as many natural things a go first/as well as. One of the best things I’ve found for both babies is an Amber anklet. Amber is meant to reduce pain…the theory goes that when wearing Amber the baby’s body heat triggers the release of a tiny bit of oil that contains succinic acid (a naturally-occurring substance in the body) and when this is absorbed, it has an analgesic effect on the swollen and sore gums. The next is Nelsons teething granules, these come in little sachets, great for when you are out and about, and can help just calm baby down a little if it’s all going a bit wrong. I have recently found these crazy old school teething biscuits which are actually brilliant! Again it’s all about a few minutes of peace, and these Bickiepegs defo do the trick! Both Gigi and Blake have also got some relief from those teething rings you freeze, there is so much choice but we love the BamBam star! A ‘chewy’ toy is always a winner, we have the obligatory Sophie (mini one) and I also just ordered Cheeky Chompers Chewy which Blake LOVES! And as a last ditch attempt to get a bit of extra sleep, a pillow spray is always helpful. We use one ourselves but This Works do one especially for the minis and it’s fabulous! As a final thought… IT WILL PASS… They will go back to be adorable little bundles of loveliness… well until the next tooth arrives! Notes: Pictures are links to product websites. This is all my own opinion, I have no medical training. I haven’t been paid to advertise any of these products they are just things I have bought myself and liked! With Gigi I would pack a HUGE change bag even to pop to the supermarket! This time around I’m a little more relaxed and still want to get to use my handbag collection (! ), so I’ve been more and more opting for the nappy pouch (clutch, whatever you want to call it). I was gifted the gorgeous Anya Hindmarch one which is great with its different pockets and wipe clean material but at £125 it’s not the cheapest option! And to be honest it can still be a little bulky! Hence we we’ve made our own and have these canvas pouches which can be fully personalised available in the gigilovesblake shop. At £15 they are an absolute style steal! I’ve found that getting travel versions of the hand gel, and even small packs of wipes means that I can fit everything I need into this pouch for most outings. It’s only when we are going on a day trip I tend to take the full change bag now! And even when I do take the change bag I still find myself putting in the pouch because I know it’s got all the essentials in! 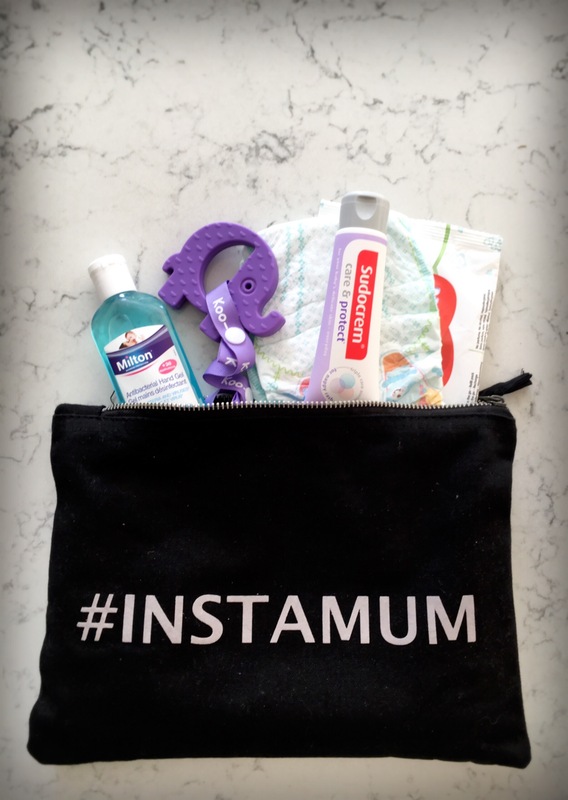 The star of my pouch has to be the Sudocrem care and protect though, I was recently sent a sample and I love it! The product itself (easily absorbed and moisturising) is great but for me the compact size, and flip lid make this the best choice for ‘on the go’ nappy cream! Social media gets bad press for making users feel bad about themselves, putting pressure on people to achieve this ‘picture perfect’ life, but for me its been quite a different experience. Following on from my previous blog post about tackling my PND, I feel that social media has actually aided my recovery. I was a bit of a late-comer to Instagram, but from the very beginning I’ve been hooked. There is such a ‘community’ for mothers, whether you are working, single, stay-at-home, or anything and everything in between. I’ve always felt a bit ‘different’ to a lot of mums; I didn’t breastfeed, I didn’t even try to have an ‘all natural’ delivery but I do want to be the one who puts the kids to bed every night, and try to get them eating healthy food. On Instagram I found other people like me, that weren’t ‘supermums’ but they were trying their best, they had some contradictions in their parenting philosophes and also saw the humor in some of the hideous situations you find yourself in as a Mother. Having beautiful photos is one thing but it’s the story behind the picture that really matters (don’t get me wrong, I do love good lighting and perfectly composed images) and that’s what helped me. From the blatant (hilarious) reality of @mother_pukka, to the comedy of @mother_of_daughters (and @father_of_daughters), the inspiration of @selfishmother, and all of those others out there making the rest of us feel ‘ok’ and like we are not the only ones who are a complete mess! On a more serious note there are also really good resources out there on Instagram, such as @pandas_uk which is a perinatal mental illness charity providing information, support and encouragement to mums and families. For me Instagram has helped me laugh at situations I find myself in (thanks @mother_pukka, @mother_of_daughters, etc), provided me with useful information (thanks @pandas_uk) and inspired me to get on and focus my creativity (thanks @selfishmother). As well as my posts about my #instafamily I have also started a #gigilovesblake store selling clothes and accessories for the whole family based on well known and used hashtags (e.g #instamum, #dadlife, #instakids etc) and also cutomised orders (e.g. #gigisays). When this is fully up and running its my intention to donate some of my profits to PND charities….first one being @pandas_uk….but I would be interested in your ideas for others??? Let’s talk about PND…let’s talk about all the good things, all the bad things that may be….? I had PND (undiagnosed) and I have PND (diagnosed). It’s the sound of a baby crying, it seems to just touch a nerve deep inside of me that makes me panic and feel totally out of control. With Gigi it was there from the moment she was born and with Blake it hit me like a slap across the face a couple of weeks in. With Gigi it never really went away, by the time she was around two years old I was ‘managing’ it, but shortly after I became pregnant and the thought of going back to the beginning again terrified me. Blakes birth was great, calm and controlled, when I held him I thought to myself ‘this is fine I can do this’, and I couldn’t stop looking at him. But then I felt guilty, why didn’t I feel like this with Gigi? The doubt started to creep in. When Gigi and Blake met I was overwhelmed with love for both of them, but then one day a couple of weeks in I broke down, I cried and I felt exhausted, not from lack of sleep but from the constant mental anguish and struggle with my identity, and emotions. My husband, my parents and my friends had seen it all before and knew what was happening. I constantly joke about my #parentfails but as I said that’s just my way of coping. It came to a head when Blake was a few weeks old, we had friends coming over for dinner (take out, obvs!) one night and I sat hallway floor sobbing. I didn’t want to see anyone, I didn’t want to do anything apart from curl up in a corner away from the world, and away from my children. Our friends arrived and I burst into tears. We talked, they themselves had been dealt mental health issues and said that talking about it and facing up to it was the ONLY option. This alone gave me some relief. The monkey was off my back but the circus was still in town. My husband said something to me that was the final push I needed – ‘if you broke your leg you’d go to the doctor, get a cast and take painkillers, so lets just go and get some treatment for this.’ And, although I wouldn’t admit to this very often, he’s right! If you have any kind of physical illness you go and get medication or treatment or advice, so why not for this? There isn’t any stigma attached to it anymore, everyone knows someone who’s been through similar, it’s the time we live in; we understand our minds more and we have more pressures than ever. So this time I went to the doctor, she was amazing, she said I had moderate PND, she advised me that medication and therapy would be the quickest way through this. She wrote out the prescription and referred me to a therapist. It only took a couple of sessions before they discharged me. You need to take the medication for a minimum of 6 months, so we are now working on a plan to wean off them. I’m not scared, because I know I’ve recovered, I just needed some calm breathing space to do it, which is what this course of treatment provided. I’m happy, properly happy, much less anxiety, no anger, and very little panicking just more relaxed, like I was before I had babies. The children are happy, Gigi has never seemed happier, yes she’s a handful and has tantrums like all 3/4 year olds but she smiles, like I’ve never seen her smile before. We’ve bonded. I am still exhausted getting up at 6am everyday with the kids, and working, and trying to be a fun wife…yes I still shout sometimes when Gigi takes all of her clothes off as I’m trying to get her out of the house and off to nursery school….yes I still look forward to bedtime so I can have some peace and quiet (and wine)…but I no longer want out, I am no longer fighting the fact I’m a mother. Just because I’m a mummy doesn’t mean I can’t work, go out on dates with my husband, go away without the kids, drink wine with my girlfriends, wear leather trousers and high heels, sing at the top of my voice to Kisstory, and spend way too much of my time on Instagram! It’s changed me in so many ways but it doesn’t have to consume me. And that doesn’t make me a bad mum because I want to engage in things other than my kids! My story is that you don’t have to suffer, it’s not worth it. It’s no good for you, your children, or your partner. You’ve got to take care of yourself to be able to look after others. It’s also VERY normal, the more I talk about it the more I’m finding so many people who’ve been through this. Every story and experience of PND is different but by seeking help the outcome is generally better for the whole family. Last night I fell through the door at almost 1am (after a fab evening at my bestie’s hen do!). After negotiating the stairs I made my way to the bathroom. No matter what state I’m in or what time it is, I ALWAYS TAKE MY MAKE UP OFF! I’m not one of those ‘lucky’ ones with perfectly clear skin so washing my face before bed is so important to me. I’m currently having a ‘break out’…. and last night for whatever drunk reason I decided to put Sudocrem all over my face…maybe because it was just sitting there next to the sink looking at me! Sudocrem – spot treatment and after sun. Baby Powder – dry shampoo (!) and primer for eyeshadow and lipstick (apparently makes it last for hours). Baby Oil – eye makeup remover, dry heel treatment, and removing any bits of leftover wax after a trip the salon. Baby Balm – cuticle softener. Now I just need a cure for my hangover! What do you use your kiddies/babies products for (other than there intended purpose!)??? This isn’t a list of what you’ll need to be able to sit down without wincing or to help your milk come in…its so much better than that! When I was pregnant with Gigi the preparation was all about the nursery, putting the Bugaboo together (thank god for YouTube! ), washing all the baby clothes…but there was one thing I neglected – ME! So this time around (we mostly had all the things Blake would need, and we were relying on lovely friends to gift us boys clothes) I made myself a little postpartum goodie bag for when I arrived home from the hospital. I’m so glad I did this, it was such a nice treat! Since doing it for myself, I have been thinking it would also make a great gift for any new mum, you can put anything you like in a gift bag to help her through those hideous first few weeks! Poor little Gigi, as well as the reflux she was, and still is lactose intolerant – this is my husband’s fault (! ), he has been since he was born. I’ve heard the stories of 20+ poo nappies a day from my MIL a dozen times but bizarrely this isn’t how it presented itself in Gigi. For Gigi it was the other way, the lactose makes her VERY constipated…so you can imagine the joy (NOT) of a screaming acid reflux baby plus now constipation. Again, as with all these things it took months to get properly diagnosed, despite it being in the family. GPs seem to assume everyone ‘thinks’ their offspring have allergies and intolerances, which maybe they do….but shock horror some of us actually do and they do need proper advice and treatment. So as not to make this into a thousand word post, I will cut to the chase…we saw a paediatrician (finally when she was one), who was great and got some advice on how to deal with it. He suggested keeping her on formula as it had less lactose than cows milk and confirmed that giving her a little lactose would help her in the long run. It certainly did and now, like my husband, she can take a little lactose (maybe a scoop of ice-cream at a party, the odd Babybel etc), but on a day to day basis we give her Arla Lactofree products (Milk, cheese etc) and it seems to work for her! So with Blake I was really aware that this might be a problem again and after a lot of research, talking to the midwife and other mums I decided to give him goat’s milk formula. The brand I chose was Kabrita (available at boots.com and Ocado). Goats milk is more easily digested and as far as I understand contains less lactose that cows milk, but still has some. He started off well with this, but after a couple of weeks he was getting some tummy ache so I added into the formula some Colief drops (they turn lactose in the milk into glucose) which seemed to stop his discomfort. I’ve just this week weaned him off these (14 weeks) and he seems fine….so fingers crossed this more gentle introduction to lactose may have stopped him developing such an intolerance. Gigi had cradle cap but I never bothered treating it as everything I read said it would just go away…and it did…BUT I think it affected her hair growth, so with Blake I decide to treat it! My online research led me to Loyon. I picked it up in Boots. It worked amazingly! I sprayed it on about 3 hours before bath time and then as per the instructions shampooed it off (using the delicious smelling Childs Farm hair and body wash, as its formulated for even the most sensitive skin). I used a Tangle Teaser to brush it through and then a wet cloth to wipe the dead skin away. Easy! Its a slow morning…a late family dinner last night means Gigi is happily watching movies on the sofa and Mr Blake is napping, so I thought its the perfect time for another post. Having recently finished renovating our house we’ve been putting the finishing touches to the kiddies bedrooms. I’m a big monochrome, minimalist fan…however that doesn’t always translate well into children’s bedrooms, they do need some colour and to be surrounded by things that make them feel happy and comfortable, but also create a calm sleeping environment. So we’ve kept a neutral base (walls, floors etc) and used colour in accessories and included toys in the decorations. This makes it easier to change as they grow up. We hope you like having a sneak peek into their rooms. If I am entirely honest I never bothered with this for Gigi, I was a cooled boiled water and powder dispenser mixing kinda gal…..however our maternity nurse for Blake told me this was a big no-no….! Whoops! Apparently the formula powder needs to hit the water at a min. 70 Degrees Celsius…to kill any nasties. So we used the Tommee Tippee Perfect Prep machine to make up bottles for the day and store them in the fridge. However when it came to going out, or the dreaded night feeds I began to look for a way to warm the milk quickly. Most places you go will give you boiling water etc to heat the bottle, however sometime its just not practical and during the night it just takes way too long (as do electric bottle warmers)! My Google search led me to Yoomi. These special warming units in the teat of the cute bottles heat the milk as it flows through and gets to temperature within 60 seconds! The bottles themselves are very stylish but I would say they are not as good as the wonderful Dr Brown’s, but I imagine for breastfed babies they would be great due to the shape and softness of the teat. For me though, its all about the amazing technology to warm the milk so quickly with just the click of a button. The sterilising and charging is a bit annoying (I chose to wash and then boil for 30mins which sterilises and charges at the same time), but to give you a warm bottle so quickly in the middle of the night, it helped hugely with Blake’s sleep training and I can’t recommend it enough!